WHITE ACE : Potomac Supplies, offering everything stamp collectors need! 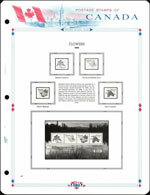 Some of the special qualities of a WHITE ACE Historical Stamp Album are immediately apparent: the vivid colors, for example; the unusual border design; the pictorial vignette; the descriptive annotations. Others become obvious only after you have had your album for a while: the rounded page corners, that prevent dog-earring; the illustrations in all display frames, that make locating and mounting a breeze; the rag content index stock, that never turns yellow; the annual supplements, that keep your album up-to-date. These and many more plus factors in a WHITE ACE Album reflect the philatelic and artistic know-how gained in years of album publishing . . . years of striving to provide America's collectors with the maximum in collecting pleasure. WHITE ACE Albums are produced by a large staff, people who are collectors themselves; who know, therefore, what philatelists want and need in a stamp album; who take as much pride in albums they create as do the collectors who use them. This album has been prepared with the average collector in mind. Spaces are provided for all regulary issued stamps; no provision has been made for errors,freaks or "made to order" issues. 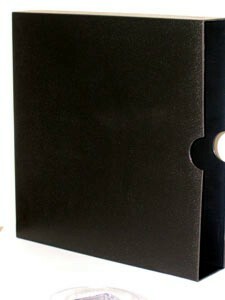 If you collect special items and varieties not included in this album-such as covers, used blocks, or shade varieties-there are available blank pages with matching borders. 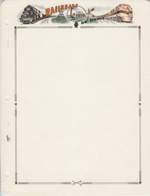 These may be purchased from the dealer who supplied this set of pages. Your dealer also will have the supplementary section published each January for this album, covering the postal issues of the previous year. He also has a complete line of WHITE ACE Historial Albums and philatelic accessories, all premium products that add to the joy and educational value of stamp collecting.